A lot of Independent filmmakers in Japan feel that they have no place in the Commercial Multiplex theaters and they don’t even try to submit their films. I personally feel that we should play our movies in every movie theater we can. And I know from experience that a lot of the Multiplex people are open to the idea of playing Indy Movies if we can present them with an interesting marketing plan that minimizes their risk. In Japan, we have been and will be playing “Looking For Anne” in quite a few Commercial Multiplex theaters, as with the Star Cinemas in Okinawa (they exceptionally played our movie after the Art House Theater, Sakurazaka…) and the T-Joy Cinemas in several Japanese cities among others. 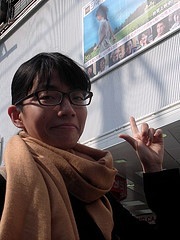 The Mitte Cinema in Kagoshima, which belongs to T-Joy, will play our movie on one of their ten screens from the 15 of May 2010. Shot on iPhone, while running around, the quality of the footage is very poor. I post it to give an idea of how it looks like. 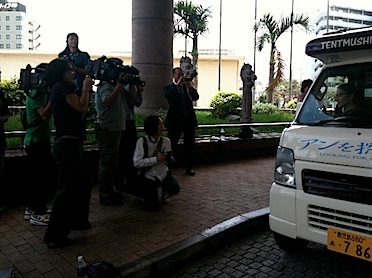 On April 20, we had a Press Conference at the Loisir Hotel in Naha to announce and explain our trip around Japan. Takako talked about how she and Yuri will proceed for the communication on Twitter, the Japanese blog and the use of Internet in general. Yuri talked about how she went about to find our precious sponsors and the type of itinerary that we were working on, visiting the cinemas and media in each prefecture. CGF002 Why the Movie Trip around Japan? Yuri had been toying with the idea of making a movie along the spirit of “Anne of Green Gables” for years when our son and co-producer, Samuel, persuaded her to go ahead with her project. Yuri wrote the script with Takako Miyahira, my long time assistant director, in order to reach a large Japanese audience fascinated by the Montgomery books. Two years later, Takako succeeded in delivering a superior first film, sharing the Montgomery philosophy in an entertaining original story, with reflections about society and the human condition. A feel good, intelligent movie that avoids the tear jerking stuff, “Looking for Anne” had all the winning conditions to make an excellent box office success. With the arrival of the economical crisis however, and a few other factors that are not relevant for this discussion, we lost quite a few major players for the financing as well as the distribution of our film in Japan. We ended up inheriting of all the distribution rights for our movie, and a few additional debts that were not expected. Since Yuri and I had a long experience in movie distribution, we saw the situation as a new opportunity to make things happen rather than waste time feeling bad about it. But for years, when our Québec filmmaker friends would ask us to find a distributor for them in Japan, we kept explaining that distribution there was an extremely expensive operation if one wanted to have even a minimum of exposure in this much too crowded media scene. Even for free, distributors were not willing to take any film unless they had super stars in it or a shocking element that would make the media drool. We were too well aware of the situation: we are talking about a very strict minimum of $300,000. to have some sort of a visibility in the media. Most of the Japanese campaigns never go for less than $500,000., the million being the norm for your standard commercial movies. We had an extremely large, passionate and well identified audience for our movie, but we also had a little less than $100,000 to let these people know that our movie existed. 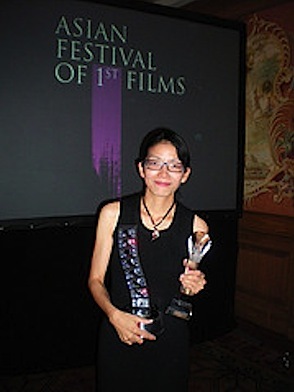 Nevertheless, Takako went on to win the two top prices for “Best Director” and “Best Movie” at the Asian Festival of First Films in Singapore in November 2009 and got some press coverage. These prices gave us the necessary exposure to score some interesting numbers here and there, where we managed to let the people know about our film. In Naha, Takako’s hometown, we were able to generate an amazing media attention which brought a bit over five thousand people at the Sakurazaka Theater in three weeks. From there, the Major Theaters contacted us, and surprisingly, we were able to move from the Art House circuit to the Multiplex circuit, which still needs and wants to play Independent movies when they see the opportunity. As a filmmaker, I’m very concerned with the state of film distribution in movie theaters as we have known this until now. Many people wonder if Independent Cinema will survive in the coming years, how it will find its way to the audience and under what format. Obviously, VOD and the Home Cinema are changing the picture. I thought it might be of interest, as we travel in forty-seven different Prefectures in Japan, to introduce some of the movie theaters of the country. Beginning with the Sakurazaka in Naha was a logical starting point, since Okinawa is where we begin our trip, but also because this theater played an important role in convincing us to jump into that trip operation around Japan. This is my first blog ever. I feel kind of weird but also very excited. I’m a filmmaker, not a blogger. Somehow, I find it intimidating to tell the truth. It all feels a bit awkward right now, but I hope to get the hang of it after a few posts and some feedback… Some friends suggested that I start a blog a while back, but I felt that I needed to start with something special, an event that would be worth sharing with everybody. I found my “pretext” for the blog two months ago: a trip around Japan in a funny looking, tiny and ecological car, visiting movie theaters and what have you in all of the 47 Prefectures. I will travel with one of the producers of our last feature film “Looking For Anne”, Yuri Yoshimura, who also happens to be my wife and the co-writer of the film… The director of “Looking For Anne”, Takako Miyahira, who used to be my assistant on several films before co-writing and directing her first movie, will also join us. We will engage on a journey of fun and discovery of an exceptional country. I can’t really promise anything yet about what shape the trip, the blog and the videos will take. All we know at this point is that it will be at least 7,000 kilos, crisscrossing from one place to the next on a pretty crazy schedule: at least three hours of driving everyday, meeting several local media, some movie theater owners or managers, shooting some fun material of people, places, before editing, uploading, etc. Ideally, I will be writing and posting pictures everyday, and a short video as well. Eventually, I might have a French blog as well, if time allows. Yuri and Takako will take care of the Japanese blog about the movie, “Anne o Sagashite” that has already been going on for quite some time. We are scheduled to depart by ferry from Naha, Okinawa on the 21st of April. We will head for our first city, Kagoshima where we will arrive on the 22nd. In the coming post, I will try to give more information about the whole operation.